This Brown Guy Quits KSTP. You Can Do Something, Too. In light of KSTP’s doubling down on their absurd report slandering a community group, a young organizer, and Mayor Hodges of Minneapolis– a report for which they have been ridiculed by local and national media and called “extremely racist” by the Southern Poverty Law Center–concerned Minnesotans have to kick up their game. Until the station apologizes for their offensive news coverage and engages deeply with the community they have insulted, we should all do everything in our power to reject KSTP. Here is the little I can do. For the past few years, I have had the opportunity to be an occasional political commentator on local TV and radio. I love doing it. 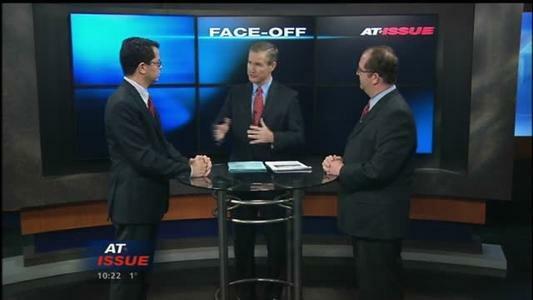 I have been for the past several years part of the stable of commentators rotated on KSTP’s Sunday morning political talk show, “At Issue with Tom Hauser.” I have deep respect for Tom Hauser, he has always been very welcoming me to his show, and he is not a part of the news team that brought us #pointergate. That notwithstanding, after the station has chosen to blame the public for “missing the point” –get it? isn’t that cute?–I simply cannot in good conscience have anything more to do with KSTP. This is not a sacrifice for me. I don’t get paid to do any political punditry and I don’t do it that much. (I was scheduled to be on At Issue twice this month.) Here is the only thing that truly bothers me about this. If you watch At Issue regularly, you may have noticed one thing. This light-skinned Puerto Rican is diversity on that show. And not just on that show. Politics and political commentary, as well as news reporting, is simply not as diverse as Minnesota has become. The thing I have wondered incessantly since Jay Kolls’ inflammatory piece first aired is, how many eyes looked at that story and saw no red flags? Or, as one twitter use replied to me, “how many saw the red flags, but didn’t feel able to voice their concern?” I don’t know how many people of color are in the KSTP newsroom. Anecdotally, after years of going into the studio fairly regularly, my guess is not a lot. And so it is no small deal for me to make the KSTP news operation even less diverse, but there are times when we all have to do what little we can. Some may be wondering, what can we all do together? Just as social media has brought national attention and derision to this travesty of journalism, we can use our collective power to let KSTP know that the public rejects their newsroom’s double-down. First, let KSTP know of your outrage. You can find their comment page here or you can call their newsroom phone at 612-588-6397. As always, please be civil but firm. Also, continue tweeting at them your outrage, letting them know you refuse to watch their show and will not patronize their advertisers. Tell them to stop standing by the shoddy reporting of Jay Kolls. He is damaging their brand, and maybe eventually they will realize the problem he is for them. A twitter user calling her/himself @kstpadwatcher has begun tweeting the names of companies advertising on KSTP news. The account was just created and doesn’t have many followers, but watch there to see if this develops into a full-fledged campaign. With advertisers, let them know why you object to their sponsorship of a TV station that displays such an appalling disregard for journalistic ethics. Let’s not let the Minneapolis Police Federation off the hook. The Federation’s president, John Delmonico, chose to pursue a vendetta against Mayor Hodges because she dared assert that, while the overwhelming number of cops are good men and women doing their jobs, there are a few who damage the reputation of the whole force. In response to Hodges’ “Open Letter” to the community of Minneapolis, Delmonico wrote his own open letter stating that the problem in the Minneapolis Police Department is too many officers are being disciplined. After his role in #pointergate, it is clear that John Delmonico himself is one of those cops damaging the reputation of the corps. The Federation’s email address is info@mpdfederation.com and their phone number is 612.788.8444. Remember again, civil but firm. The twitter handle for the police department is @MPD_PIO. It is important to make a distinction between the action of Delmonico and the force as a whole. It is the opinion of many that there is a cultural problem within the department; one role the public can play in improving that culture is highlighting the difference between cops who are building community and those who are damaging it. Finally, you can do something proactive. Minnesota Neighborhoods Organizing for Change is the community organization that was slandered by KSTP and Jay Kolls. They are a youth and people of color-led organization that is doing amazing work focused on the North Side of Minneapolis. Support their work. Throw a few bucks their way. You can also follow their work on Facebook. I don’t at this point need to summarize for anyone the scandal of ethics and journalism that has become “Pointergate.” If you want to get caught up, some of the best things to read or listen to include the interview MPR News did with Anthony Newby, the Executive Director of Neighborhoods Organizing for Change; University of St. Thomas Law Professor Nekima Levy-Pounds’ brilliant, “Dear White People: Mayor Hodges is Not in a Gang”; and the first blogger to bring national attention to #pointergate, Shaun King, “Pointergate may be the most racist news story of 2014”. Here I’d like to just speak a little to KSTP’s follow-up story, where they double down on their original reporting, re-interview the same retired cop and continue to ignore the outraged community (the only person of color featured in any of their news stories about pointergate is the blurred face of organizer Navell Gordon. That is not only not a good explanation, that is precisely the problem, KSTP. You ignored the context in order to sell a sensationalist story spoon-fed to you by the Police Federation. If you had named the organization, explained what they were doing, and given the full context, viewers would have immediately seen how insane was the proposition that the Mayor and Gordon were flashing gang signs. If you’d named the organization, you would have had to admit that, despite what reporter Kolls claimed in his first story, NOC did reach out to your newsroom to correct your interpretation before the first story aired. I know this for a fact. I have worked with NOC for years and have been in regular communication with Anthony Newby since Kolls first started digging around about this story. I know, for example, that upon learning from KSTP what they planned to say about that photograph, NOC sent the newsroom many more photos of the event, including those showing Police Chief Janee Harteau right by Mayor Hodges when she canvassed with Gordon (and just out of frame of the camera of the #pointergate photo). Your newsroom didn’t blur Gordon’s face and fail to name NOC out of some concern for him or the community — you did that because, had you done basic journalism, your story would have fallen apart. And the mendacity continues. Friday night’s rehashed argument on KSTP still makes no mention of the above video, which debunks the story’s entire premise. As of Friday afternoon Jay Kolls said on Joe Soucheray’s radio show “Garage Logic,” that he still had not seen the above video! (By the way, when Joe Soucheray and Twin Cities progressives are agreeing that your story was horse manure, you’ve got a problem). Poor Jay Kolls must have been so busy sending angry tweets the night his story first aired (he has since stopped tweeting) he just didn’t have time to click on a video that has now been viewed over 160,000 times. He obviously still wasn’t able to get to it before the Friday night newscast. Research is hard. Yes, we should focus a lot of organizing attention on a station as irresponsible as KSTP, but there are deeper issues that the community conversation must consider. The next time talking heads on TV wonder why the relationship between police departments and the communities they serve, remember John Delmonico’s role in this and remember #pointergate. The next time journalists of color call out the lack of diversity in newsrooms and the effect that has on coverage, remember #pointergate. The next time a black kid gets shot because someone thought something he was doing with his hands — a gesture, reaching in his pocket, putting his hands up in the air — gets misinterpreted, remember #pointergate. ← Minneapolis School Board Race. Some Thoughts Before You Vote. don’t forget filing a complaint with the FCC as an action step. Thank you for your action and your post. The first feeling I had upon reading KSTP’s response was anger because of powerlessness. So often it seems as though organizations in the news media take opportunities like this to “spark debate” rather than admit mistakes and attempt to do things better, meaning there’s no retribution for truly hurtful incidents like these. You’ve let people know that there are things we can do, and you’ve taken a brave personal stand that reminds us that no matter how bad things get, there are always good people in the middle. Thanks again. Context. It’s what helps us understand the news. Thanks for this powerful statement and summary of action steps. KSTP don’t care about what people of color think, or the their White alies. KSTP doesn’t have to answer to people of color, and to be honest most whites don’t care. When they go downtown Mpls, they see a bunch of poor people of color. Most of them just think they are “lazy”, and “bums” and “moochers of the system”, and can give you many examples. Not that they have any real interaction with people of color, it what they “see”, and “hear”. Most whites have no incentive to change things. Why would they? Things are on the upswing for whites. New buildings are going up downtown. All of the workers I see are white. The people moving in the new buildings are white. There is ALOT of work being done on West Brodway. All of the work is being done by whites. When a area is getting fixed up, the fix is in. Move the Blacks out, and the whites in. At least KSTP doesn’t pretend to care, as many liberals do. Many whites are liberal abouts gay issues, animal rights, and for the enviroment, but caring for people of color is passe. It’s sad that it’s easier for some to feel more compassion for a dog than people. That’s the direction we are headed. I don’t know what is going on with those types of white people. I’m white, and I don’t tolerate racism in my presence. I have friends that are like me and that I learn from when they are more enlightened than me. It’s never too late to learn, and racist white people have a lot of changing to do. Please believe that many white people see the beauty, honor, and strengths of black people and other races, not making a big deal about how wonderful they are to be doing this, but just seeing people as people. The people that look ugly to me are the racist ones scowling, making ugly remarks, and acting stupid. I give them a look. If I know them, I ask them what the problem is. It boggles my mind that KSTP is getting away with this and that they are waiting for the anger to die down. I’m counting on the mayor, the police chief, the caring citizens, and the good cops to improve the situation in Minneapolis. Didn’t Dave Dahl deny climate change and say the earth was cooling? I have not watched KSTP because of their biased daily news reports complete with their personal opinions. News should be information without personal opinions. Thanks to Ronald Reagan passing the law the opened up the change to add personal opinions in news reports. This shows bias. We need to change the law back to manners, no slander, and respect for another human being and their role without contributing to damaging their character over the air waves. Only racism allows such an ugly story and stereotype to be advanced about a young man who was clearly not flashing a gang sign with the mayor of Minneapolis. He deserves a public apology and heads should roll at this station for even allowing it to ever make it to the air. I had to email Jay, and you can to email him at jkolls@kstp.com. I had to voiced my concern regarding his racist story on Mayor Hodges “gang signs” I also emailed the KSTP News Director, Lindsay Redford, at lradford@kstp.com but have not received a response. But Jay Kollis should be fired and Lindsay should be demoted at the least. I think If your stupid enough to air this shabby reporting.. Your to dumb to have the job of news director. Thank you for posting not only your thoughtful critique but these concrete action steps. I’m working through the list right now!